This topic shows how Faces and Planes in SOLIDWORKS are named and how rules are built in DriveWorks that refer to them. DriveWorks requires named Faces and Planes when using some Generation Tasks (see Create Angle Mate for example). In the SOLIDWORKS graphics area, right click the Face to be named. Expand the menu and select Face Properties. Click OK and save the model. 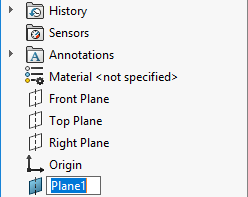 Click on the Plane to be renamed in the SOLIDWORKS Feature Manager. Enter the new name once the original name is highlighted. References to Planes can only be one level deep. For example, the rule: [Face Name]@[Generated model name]@[Generated Sub Assembly name] would not be valid. References to Named Faces can be more than one level deep. See below for examples of using Named Faces in parts that are more than one level deep. For these examples the same Part will be used. The Part is called "Bracket". For Instance Number "-1" will always be used. These examples are making use of the Special Variable "DWSpecificationId"
Named Face (in a Part that is in a sub assembly of an assembly) "NamedFace@SubAssy "&DWSpecificationId&"-1/"&"Bracket "&DWSpecificationId&"-1"
Named Face (in a Part that is in a sub assembly, in a sub assembly of an assembly) "NamedFace@SubAssy "&DWSpecificationId&"-1/"&"SubSubAssy " &DWSpecificationId&"-1/"&"Bracket "&DWSpecificationId&"-1"